Precast concrete projects have many moving parts that must be organized appropriately to meet customer needs. And when a project involves designing, manufacturing, transporting and installing hundreds of precast products, the added complexity also requires effective communication and teamwork from all parties involved. This was especially true for Gillespie Precast and Oldcastle Precast and the developers, crane operators and construction crews they worked with to ensure their recent, large-scale stormwater projects were completed successfully. Confidence in the housing market has increased to an all-time high (1). As confidence continues to grow across the U.S., Orange County, Calif., is experiencing rapid population growth (2). As a result, Oldcastle Precast installed a precast concrete stormwater detention system there, which was its largest to date. Oldcastle worked with general contractor Landsea Holdings Corp. to provide a stormwater solution for a new community development in Lake Forest, Calif. The development features single-family and senior housing along with a 10,000-square-foot ground floor commercial space and a public park with trails. 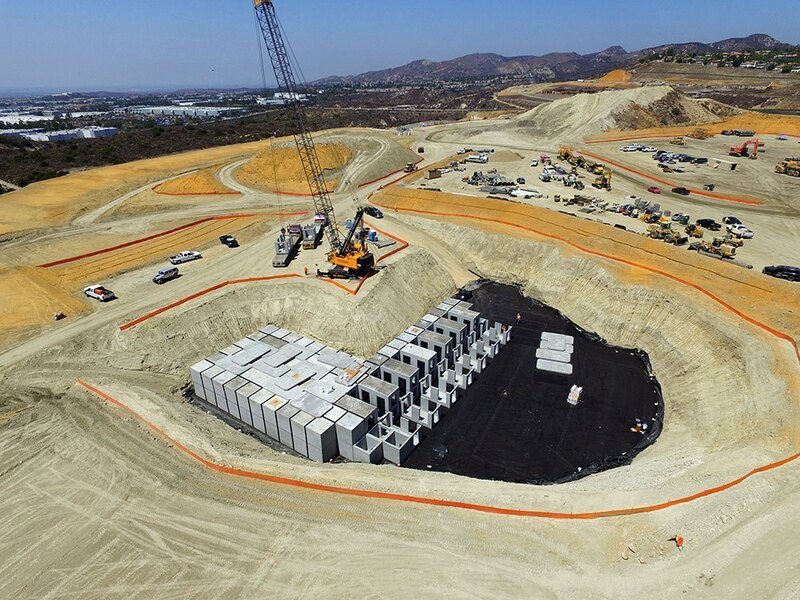 The Storm Capture stormwater detention system installed to mitigate the area’s stormwater runoff consists of 320 units that were manufactured in Oldcastle Precast’s Perris, Calif., plant. The units create 10 basins, providing a total detention storage volume of 820,886 cubic feet. Oldcastle Precast’s largest stormwater detention system to date provides a total storage volume of more than 800,000 cubic feet. Photo courtesy of Oldcastle Precast. According to Philip Felton, vice president of sales for Oldcastle Precast, each unit was based on a clamshell design with a 7-foot base and a 7-foot top. Basin No. 5, the first system installed, has an inside height of 14 feet and was designed to withstand 16 feet of backfill. It can hold up to a 10-year storm event. As part of the contracted services, Oldcastle Precast designed, manufactured, delivered and installed all the precast components. The units were shipped on flatbed delivery trucks to the job site and installed over two and a half weeks, which “demonstrates the speed of construction precast offers,” Felton said. Another key to the success of the project was effective project management from the early design phase through installation. According to Mary Scott, project manager for Oldcastle Precast, communication was extremely important since the project underwent many changes and redesigns. However, having one person in charge of coordinating every part eliminated unnecessary confusion and made the project a success. The massive stormwater system is designed to hold up to a 10-year storm event. Photo courtesy of Oldcastle Precast. Along with the stormwater system, Oldcastle also manufactured and delivered large biofiltration units to address the water quality requirements for the project. Scott said since Basin No. 4 is now manufactured, the project will be completed this fall. The arch is a basic design element made popular by the Romans. It maintains its strength and shape over time by resisting compression and in turn eliminating tension. a modular, single-chambered precast concrete arch structure. “What prompted us to create the arch system design was to compete with plastic,” John said. “The arch system’s geometric compression shape keeps strength while reducing the amount of concrete used in manufacturing, which in turn reduces labor costs. With these benefits and more in place and the structural design of the product finalized, the Rotondos next needed to show local contractors and department of transportation officials how the system worked. But instead of doing a job that required just a few products to be manufactured and installed, the Rotondos went big, partnering with Gillespie Precast on a project requiring 372 units. In 2015, the Prince George’s County Board of Education approved a contract to build a new, modern public high school in Capital Heights, Md. Construction began mid-year and the project included three phases. The first phase entailed placing the underground infrastructure for the new development. Like many regions in the U.S., stormwater runoff needed to be kept at pre-development condition. Therefore, a detention structure was specified to not only hold the water back, but meter it out slowly. The StormPod Stormwater System proved to be the best choice to meet both needs. Gillespie Precast’s plant in Chestertown, Md., manufactured all 372 units. Jim Talbott, Gillespie Precast president, said the job was unlike anything the company had ever done before. “Gillespie was selected because Rotondo Environmental Services felt comfortable that our team would be able to see this job through to the end with the attention to detail and a quality product that was needed to ensure their first job was a success,” he said. Gillespie Precast manufactured nearly 400 stormwater units for a new high school in Maryland. Photo courtesy of Rotondo Environmental Solutions. Each of the 372 StormPod units is 8 feet wide by 16 feet long and consists of a base slab and top arch that are bolted together the day after they are poured. The arch unit is poured right-side up and the base slab is poured upside down to give the unit a smooth surface. The mix design included synthetic reinforcement fibers that provided additional strength and support. Talbott said because Gillespie does not regularly use synthetic fibers in production, the self-consolidating concrete mix design had to be modified to flow properly with the high dosage of Euclid Tuf-Strand fibers. “With the help from the fiber supplier and our admix supplier, the first few weeks we were continuously tweaking our mix to improve the flow through the thin sections of the arch forms,” Talbott said. “With the help from the fiber supplier and our admix supplier, the first few weeks we were continuously tweaking our mix to improve the flow through the thin sections of the arch forms,” Talbott said. According to Rich Rotondo, the form maintains tight tolerances since the arch unit and base slab join together along a tongue and groove system to form one module. Any deviation to either piece would cause fit issues throughout the entire project. Another challenge Gillespie faced was finding an acceptable way to store the units in the yard. In addition to working on this project, the company was experiencing a busy summer, so every square foot of yard space had to be used. The solution was to stack the units two high. Each of the 8-foot-wide, 16-foot-long units consist of a base slab and top arch that are bolted together the day after they are poured. Photo courtesy of Rotondo Environmental Solutions. General contractor Grunley Construction Company bought the modules and Total Civil Construction was the site contractor hired to complete the StormPod system installation. Because the base and arch are attached on each module, installation time is cut in half, increasing productivity and quality. The modules can also be linked together to form a larger structure. Talbott said the success of the project was achieved in large part due to reviewing the project scope with all staff members involved – from dispatch to the plant manager. The open communication between Gillespie and Rotondo Environmental Solutions also helped to ensure accuracy throughout. Construction on the new high school was completed this summer, which means the class of 2017-2018 started the school year in a new, state-of-the-art building with only the worries of exams, projects and social interactions, while precast concrete lays underground and will support the framework for learning for decades to come. Featured photo courtesy of Oldcastle Precast.